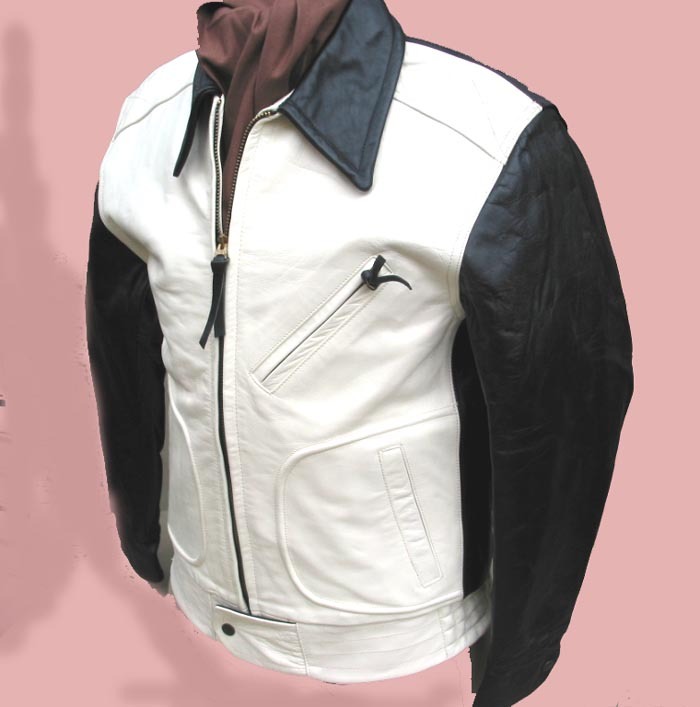 Call it Rockabilly, call it Motorcycle Jacket -- the terms converge and overlap. Call it anything, but call it Cool and Unique. Heavyweight 4.0+oz. 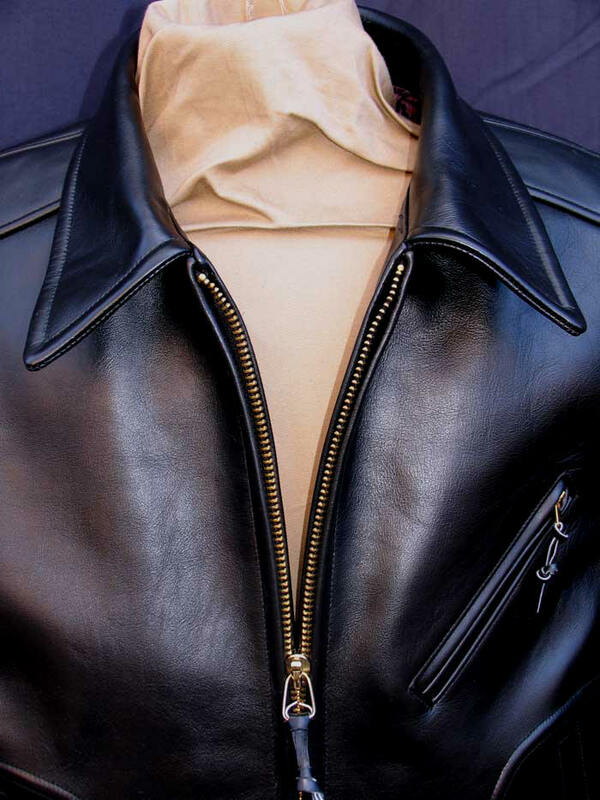 Chrome-Tanned Horsehide Leather, as the original (actually ours is heavier than the original in our collection -- being vintage doesn't necessarily mean better. Unequalled beauty, durability, feel and authenticity. 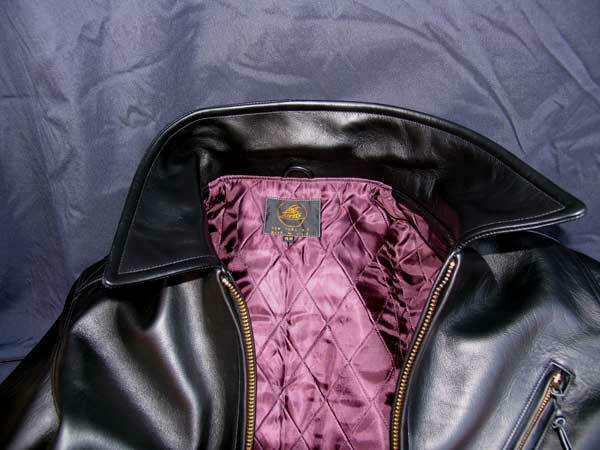 Quilted genuine 100% Pure Rayon Lining (not polyester), also per original. 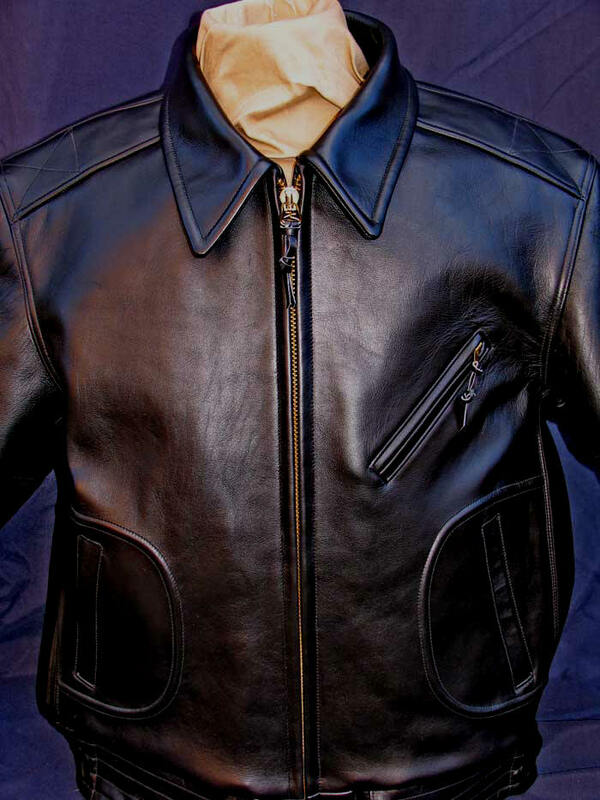 Saddle-Welt Pockets, Elasticized Waist, Brass Talon Zippers, Snap Cuffs. Note the workmanship in the detail shots: unrivaled, for difficulty and achievement. First-timers are amazed, our existing customers continue to be. The ROADMASTER is well-cut -- a bit fuller than many of our vintage designs. (But never oversized, blouson-like or baggy). Two-Tone or Solid, it looks equally good. Many musicians grab this one but it's just as good off-stage for the rest of us. 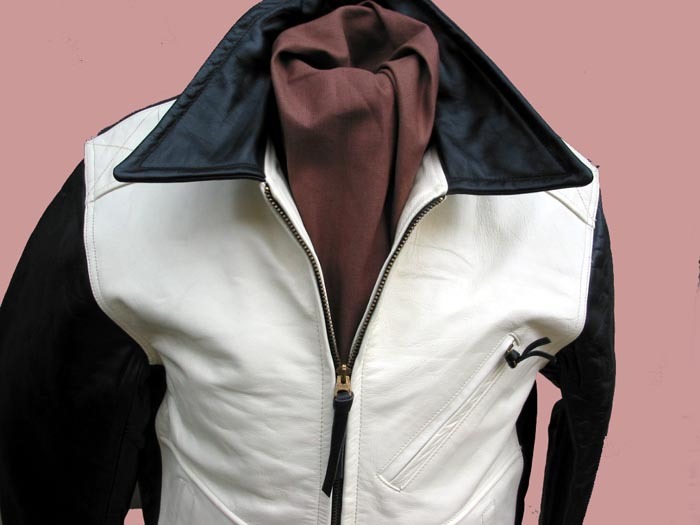 The very limited BLACK/CREAM HORSEHIDE ages (i.e., yellows, for a spoiled milk look) especially quickly, to look convincingly old in a short time. 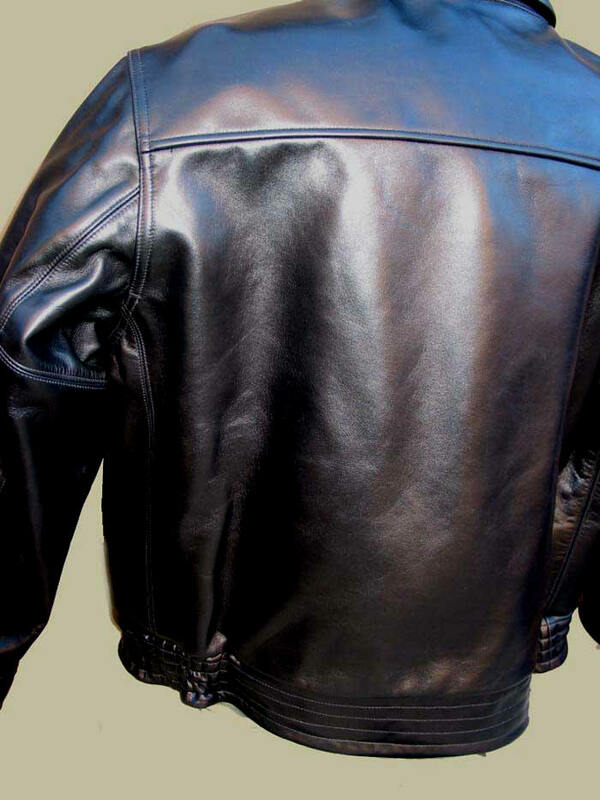 (Vintage two-tone leather jackets are worth a fortune to collectors; here's an equal, or superior, and new.) 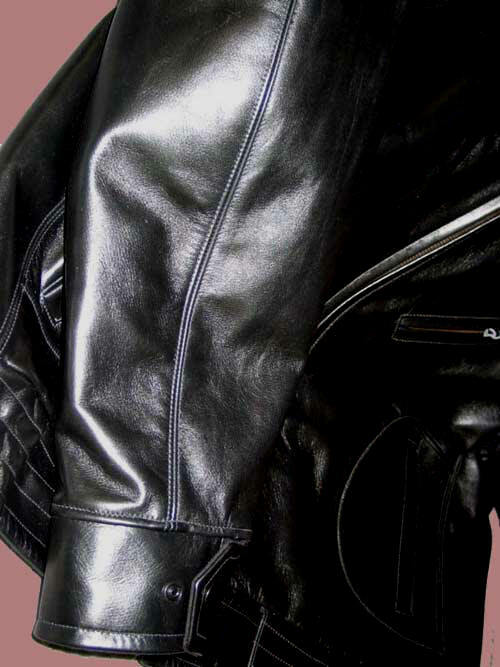 Horsehide never sacrifices strength or longevity the more it's used. Famous for outliving its wearer -- in the long term of course! The horse has the last laugh. But remember -- no horse is ever -- EVER -- killed for its hide. Thus to use true, correct Horsehide as LOST WORLDS does is, in fact, homage to this noblest of beasts. And recognition how the horse has sacrificed itself for our concept of civilization. If you ever get the chance, see Robert Bresson's LANCELOT, the Arthurian legend taken from the perspective of the horse. Eye-opening. We love the ROADMASTER. Warm and just really comfortable due to fantastic Rayon Quilting. You'll note that many "distressed," "oversized," fashion jackets appropriate its details: the elasticized waist, welted pockets, etc. This is the one the "fashion" labels copied, understanding how cool it is. "It's an intense and wonderful garment, and I am enjoying the long process of building a relationship with it."